Absorption completions continued to rise during the third quarter of 2014. 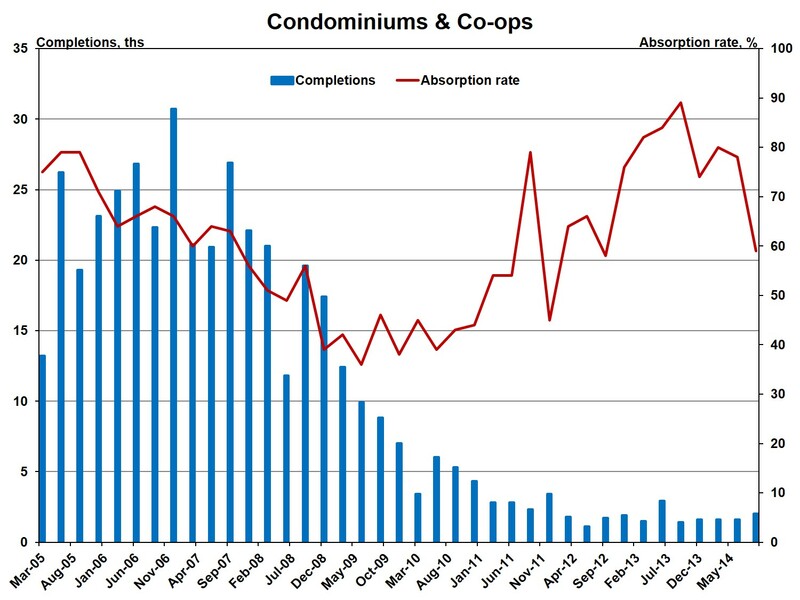 While for-rent apartment absorption rates remained strong at the end of 2014, there was a drop in short-term absorptions for the condominium and co-op market. According to NAHB analysis of the most recent data from the Census Bureau and Department of Housing and Urban Development Survey of Market Absorption of Apartments (SOMA), completions of privately financed, unsubsidized, unfurnished rental apartments in buildings with five or more units totaled 194,900 residences for the four quarters ending with the third quarter of 2014, a 50% increase from the prior four quarter total. Non-seasonally adjusted three-month absorption rates (units rented after construction of the property is complete) for third quarter completions (rented during the fourth quarter of 2014) were effectively unchanged at 65% from both the prior quarter and a year earlier. 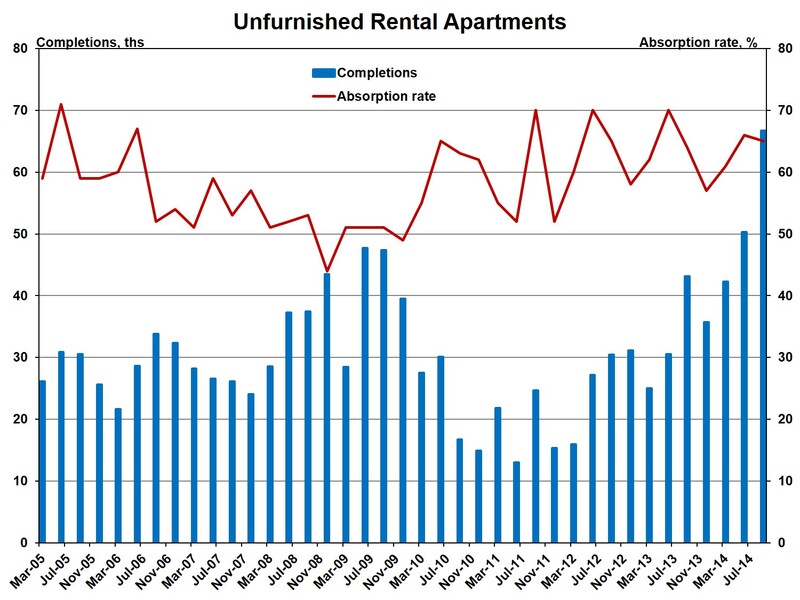 Absorption rates for rental apartments rose coming out of the recession but have established a more stable range since 2011, a period during which completions have increased substantially. In contrast, condo and co-op completions remain at historically low levels, with 2,000 for-sale multifamily homes (in 5+ unit properties) completed during the third quarter of 2014. The non-seasonally adjusted 3-month absorption rate for for-sale multifamily for condos completed during the third quarter of 2014 and sold during the fourth quarter weakened to 59%, off the 89% rate reported a year earlier. This was a noticeably weaker absorption rate compared to the results of the prior two years. The SOMA data also reveal that for properties with five or more units, approximately 8,800 Low-Income Housing Tax Credit or other federally subsidized units were completed during the third quarter of 2014. This is down from the 10,600 such units completed a year earlier. 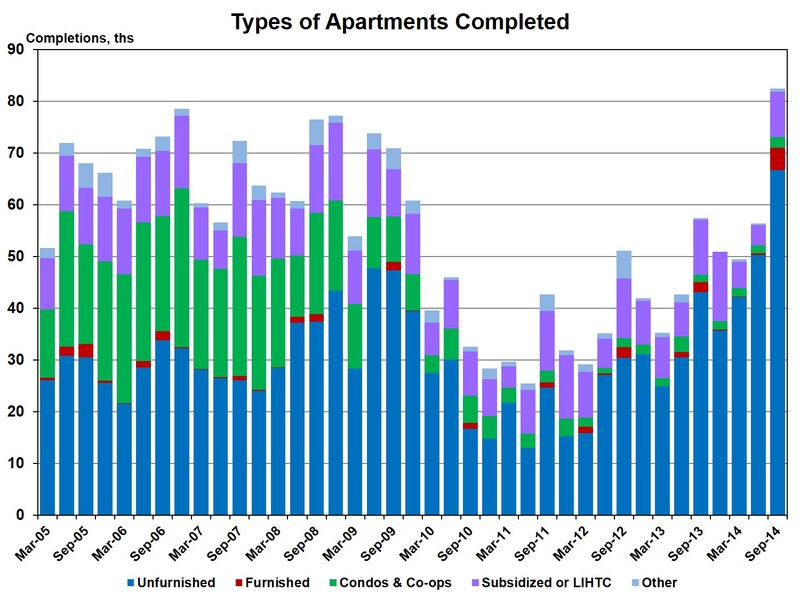 Over the last four quarters, 31,300 LIHTC and other affordable housing units were completed (13% of the total).